Physicians face various regulatory and administrative hurdles in a day, but few are as frustrating, or as expensive, as prior authorizations, or PAs. Commercial insurance companies, Medicaid, Medicare and other third-party interests use PAs to reduce costs. This leaves physicians and their staff wondering when the practice of medicine became more about the dollars and cents than what makes sense for patients? “The system is there for a reason, and we understand that,” Lee Carter, M.D., said. Dr. Carter practices family medicine in Autaugaville, a rural community in Autauga County with a population of less than 1,000. “But, it can be very frustrating, not only to the physicians and our staff, but to the patients who have to wait for their medications. 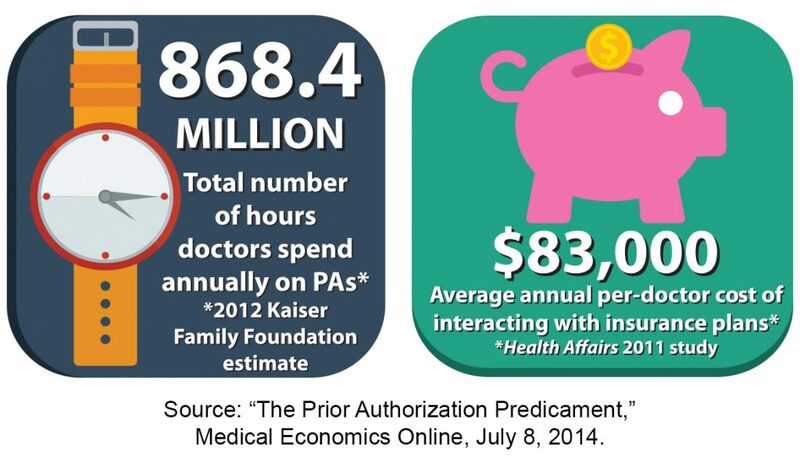 According to a 2012 Kaiser Family Foundation estimate of about 835,000 practicing physicians, 868.4 million hours are spent annually on PAs. A 2011 study by Health Affairs estimated physicians spend an average of $83,000 annually interacting with insurance plans to secure prescribed treatments, procedures or therapies for patients needing prior approvals. In Dr. Carter’s practice, he and his partner treat a variety of issues in their patients ranging from colds and flu to more chronic conditions like diabetes and ADHD as well as procedures involving MRIs and X-rays. Each physician has a staff member devoted to prescription renewals and obtaining PAs. Still, keeping up with the demands of charting and following the rules for the payers for PAs can be daunting. “When a patient comes in that you’ve been treating for months or even years, and you know there’s something new out there that will work better for that situation, you want to find what works best for your patient. Most of the time, that medication is going to be a generic, which is covered by most insurance plans because it’s cheaper for them and it’s cheaper for your patient. But, what if that med doesn’t work for your patient? What if your patient is allergic to that med or another med? You have to find a balance. That’s the key,” Dr. Carter said. For specialists like oncologist Stephen Davidson, M.D., at the Montgomery Cancer Center, issues with PAs can begin when the patient checks in for the first appointment. Dr. Davidson and his team see an average of 60 patients each day. During that time, he and his treatment team are also securing PAs for patients for imaging and medicine. Rarely are cancer medications generic, making them very expensive, so PAs must be secured for monthly refills, taking even more time away from patient care. According to Dr. Davidson, the burden of proof isn’t specific to oncology. Physicians fighting to get the best treatment regimens for their patients have all experienced the same process with payers in trying to secure prior authorizations, and perhaps the most time consuming and frustrating part of the system is the peer-to-peer conversations in which physicians advocate on behalf of their patients with the payers. For both of these physicians, the delay caused by the waiting game can put the patient’s health in the balance. Dr. Carter often encourages his patients to engage in the appeals process with their health insurance plan by calling the numbers listed on their insurance cards. Dr. Davidson has enlisted the assistance of his patients as well. Fortunately, in Dr. Carter’s experience, a reply for a PA request usually takes 24 to 48 hours. Things get more complicated, however, for specialists like Dr. Davidson. Some states have pursued legislative solutions to PA problems, but with little success, as insurance companies and their lobbyists come out in droves in opposition. As non-physicians increasingly attempt to dictate health care delivery, the Medical Association is committed to finding solutions to PAs and other related issues so that we keep health care decisions between doctors and patients.